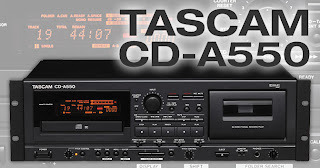 TASCAM has updated its best-selling combination CD players/cassette recorders to the CD-A550. Like TASCAM's CD-200, the new model uses TEAC's new CD-5020A drive mechanism, designed for audio playback with a smooth loading drawer and low clamping noise. New features include MP3 and WAV file playback, CD Text display, Auto Cue and Auto Ready. Also new is the digital output and pitch control for both the CD and cassette mechanisms. 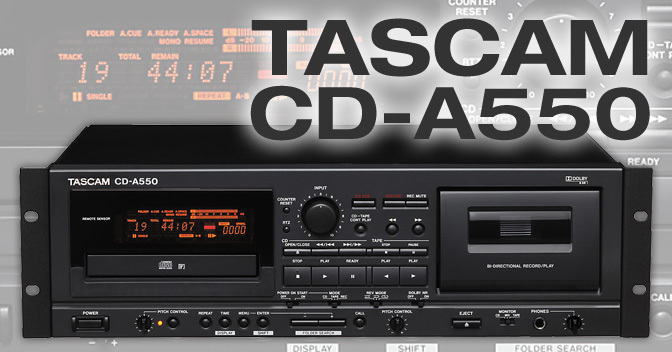 The CD-A550 is a combination CD player and cassette recorder with unbalanced phono inputs and outputs. Contractor-specific features such as power-on play, a wired remote control, rackmountable design and CD shock memory ensure reliable performance.